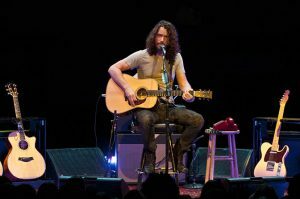 Even without the crazy news that Osama bin Laden had been killed by U.S. forces, the crowd at Chris Cornell’s hometown solo acoustic show Sunday night at the Moore Theatre was thoroughly pumped up, if not a bit crazed. And a few were well-lubricated for the occasion. 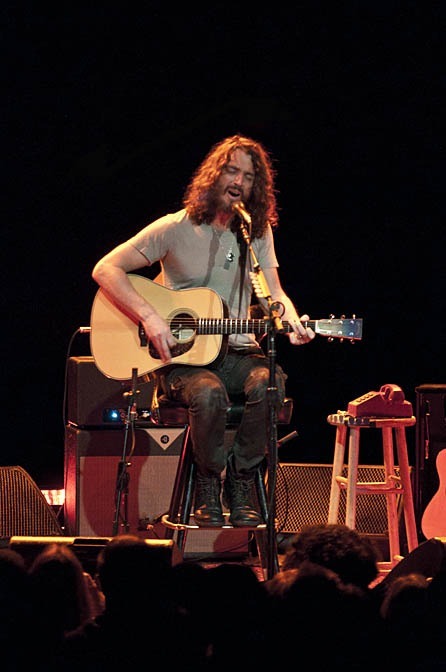 Cornell, who has made a habit of disbanding rock groups (first Soundgarden, then Audioslave), carried the entire show with ease, demonstrating just how capable he is of commanding a stage all by himself. He was an absolute powerhouse, belting out songs with a voice that rocked the rafters. The solo tour is indeed a tasty appetizer in advance of Soundgarden’s upcoming summer tour. Cornell, frontman for Soundgarden and formerly Audioslave, has used the solo outing as a showcase for his new and often stirring arrangements of familiar songs. Cornell’s “When I’m Down” was cast as a sultry nightclub tune, complete with pre-recorded piano background on vinyl (“My kids don’t know what this is, which is weird because the technology isn’t that old,” he said, holding up a vinyl record). “Man of Golden Words” (supplemented with a verse from Pink Floyd’s “Comfortably Numb”) paid tribute to Seattle’s Mother Love Bone, whose auspicious career was cut short by the death of singer Andrew Wood; Temple of the Dog’s “Say Hello 2 Heaven” (another famous tribute to Wood, written by Cornell after his death) prompted an audience sing-along. The most foreboding tune of the set was Bruce Springsteen’s dark and ominous “State Trooper,” delivered with rumbling feedback. With a soaring, howling voice, Cornell covered songs by Led Zeppelin (the extraordinary “Thank You”) and the Beatles, as well as Soundgarden, Audioslave and Temple of the Dog. Among Cornell’s stage props was an old, red, push-button telephone, which once belonged to the late singer-songwriter Jeff Buckley (who apparently used to call Cornell on this phone). The show ended powerfully with Soundgarden’s “Black Hole Sun” and John Lennon’s “Imagine,” which seemed to take on additional meaning in light of the surprising demise of bin Laden. Read more about Cornell on his official Web site. Seattle photographer Suzi Pratt shot the accompanying photos of Cornell at the Moore Theatre. Follow this link to her Web site.